Senior Pakistani officers, led by Army Chief of Staff General Qamar Javed Bajwa, realise that the way to peace and prosperity is through military cooperation with India. Will New Delhi reciprocate? 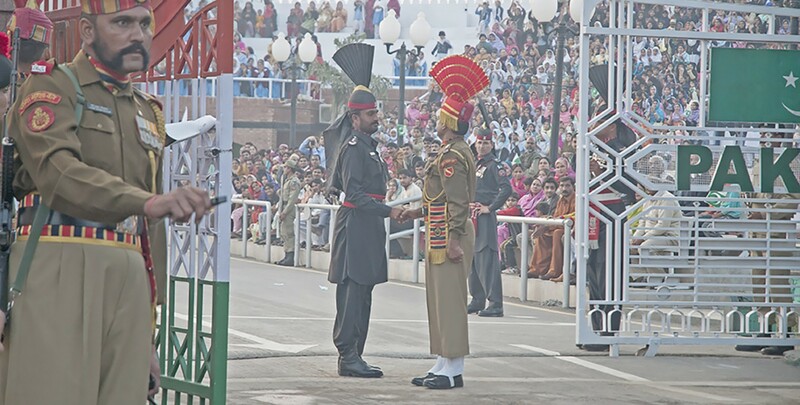 In a historic first last month, Pakistan’s Army Chief of Staff (COAS) General Qamar Javed Bajwa invited Sanjay Vishwasrao, the Indian military attaché, and his team to the Pakistan Day military parade in Islamabad. And in a sign that ties between the two foes are warming up Javed followed this two weeks later by saying that the Pakistan military wanted peace and dialogue with India. The two countries will also take part in joint military drills in Russia in September, with Chinese participation. These initiatives come against a background of almost weekly exchanges of fire along the Line of Control in Kashmir. However, they mark a change in attitudes that started when Bajwa became COAS in November 2016. Bajwa himself, speaking at RUSI last year, announced that ‘the Pakistan army is now no more insecure and feels confident of its future and that he welcomes Indian participation in Pakistan’s flagship infrastructure project, the China Pakistan Economic Corridor (CPEC)’. Both countries have tried to forge relationships before. In the 1980, the Pakistani military leader, President Muhammad Zia-ul-Haq, and then Indian Prime Minister, Rajiv Gandhi, became close. In his book, The Great Game in Afghanistan, Kallol Bhattacherjee details the talks between Gandhi and Zia on the fate of Russia’s invasion of Afghanistan, relations with Moscow and the US and, most importantly, the stability of South Asia. Like the ZiaRajiv meetings, Pakistani military leader General Pervez Musharraf and then Indian Prime Minister Atal Bihari Vajpayee came close at a 2002 summit in Agra to resolving the Kashmir conflict despite a year-long tense situation on the border. Approaches by Pakistani generals military have been welcome by some in India, because they are seen to be able to deliver on peace. Another senior Pakistani officer, Lieutenant General Aamir Riaz, headed the first-ever high level contact group with India as Director-General Military Operation. According to Riaz, Pakistan sees the CPEC project as key to its economic future and, he has made public his stance of welcoming Indian participation in this, Pakistan’s largest infrastructure effort. However, he said that India could ‘share the fruits of future development by shelving the anti-Pakistan activities and subversion’. Another top officer, Major General Ahmed Hayat, the Director-General-Analysis of the Inter-Services-Intelligence, in 2013 authored the so-called India Plan in 2013, which tried to ascertain how and when Pakistan should approach India. He concluded that the Pakistani military would approach India once Pakistan’s own defence diplomacy was strengthened and not under American threats or pressure. ‘It is a no brainer that one cannot live in an environment of perpetual enmity with a neighbour six times your size, but the indicators have to be right’, he said. ‘History teaches us to be cautious when approaching India history paints India as an anti-status quo entity’. As Pakistan feels more stable politically now, Hayat’s plan could come to fruition this year. A siege mentality in the Pakistani General Headquarters in Rawalpindi has meant that that there has been practically no major defence diplomacy between the arch-rivals. However, since the army launched anti terror operations Zarb-e-Azb in 2014 and Radd-ul-Fassad in 2017, Pakistan has seen a turnaround in its security. The generals also feel that this strengthens their bargaining power with the US after President Donald Trump accused the Pakistanis of ‘lies and deceit, thinking of our leaders as fools. They give safe haven to the terrorists we hunt in Afghanistan, with little help. No more!’ Pakistan has also embraced Russia, and strengthened ties with Turkey and China. With growing security and stability on the western border, the army understands that talking to India will help the country’s upward economic trajectory and allow regional trade flourish. However, India has so far rejected Pakistan’s offer of a transit trade dialogue on Afghan Indian commerce. But with a sustained approach by Pakistani officers to India, it could only be a matter of time before Delhi agrees to at least talk to Islamabad. Despite continued tensions and fire-fights in Kashmir at their fiercest for a decade, Pakistan’s generals want to talk and feel the ball is in India’s court. There is some rapprochement, but it is stuttering and there’s a long way to go yet. The views expressed in this Commentary are the author’s, and do not necessarily reflect those of RUSI or any other institution.